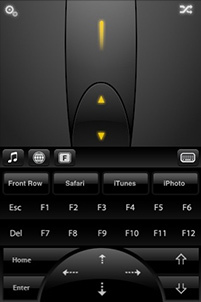 The latest version of Air Mouse, a utility that turns your iPhone or iPod touch into a wireless remote for your computer, brings the usefulness of Apple’s Multi-Touch devices to a whole new level. It has taken a few months to get there, but the number of truly useful and revolutionary iPhone applications on the App Store is starting to take off. From the ones I have tried so far, RPA Technology‘s Air Mouse ($5.99) ranks near the top of the list. I was simply blown away by the functionality packed into this seemingly tiny app. What exactly does it do? Surprisingly, a heck of a lot. For starters, it’s a wireless mouse and keyboard for your Mac or Windows PC. Taking advantage of the iPhone’s touchscreen and accelerometer, Air Mouse provides a number of options for controlling your computer whether you’re right in front of it or across the room. It’s especially handy when making presentations, operating home entertainment systems, or just lounging around away from your desk for a while. There are other apps out there that claim to do the same kinds of things, but the difference is that Air Mouse actually works — and pretty darn well. After purchasing Air Mouse from the App Store, you will be required to download their free server client (available for Mac or Windows) to install on your computer. It’s a quick install with almost zero manual configuration needed, aside from minor sensitivity adjustments. 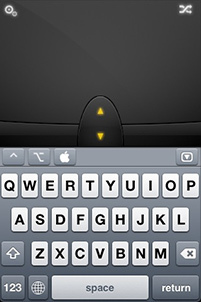 Once this is set up, you’re all set to launch the Air Mouse app on your iPhone or iPod touch and start having fun. The first way to use Air Mouse to control your computer is with the accelerometer-based air mouse mode. As you hold your iPhone in front of you and move it through the air, the cursor on your computer moves along with it. This is an excellent way to demonstrate the motion-sensing capabilities of the iPhone, but I think most people will have a very hard time getting used to it. The mouse’s behavior can become erratic and confusing at times, but that’s not where the application’s real strength is anyway. It’s all in the touch. By pressing the button in the upper-right corner of the screen, a more traditional trackpad mode is revealed. Suddenly your iPhone can become a surprisingly accurate wireless MacBook trackpad, with the added benefit of an on-screen keyboard. Don’t want the keyboard? No biggie — shake your phone up or down to show/hide it from view. In addition, a scroll pad and Multi-Touch gestures such as two-finger scrolling and right-clicking are included as well. And yet, there’s more! Turning the iPhone on its side will bring a more practical widescreen trackpad with extra room for your fingers to roam. I have really only scratched the surface of some of the more advanced settings and features provided by Air Mouse, but hopefully this serves as a good introduction to what it can do. In future software updates I’d like to see the developers expand the Multi-Touch trackpad gestures even further to support rotating, pinching, etc. Nonetheless, Air Mouse is a solid app and I’ve become so comfortable using it that I typed this entire article on a MacBook Pro using my iPod touch from 6-8 feet away (on a 32″ LCD TV). While it is obviously not meant to be a full-time mouse and keyboard replacement, I wanted to see if it could realistically be done without too many hiccups. And I can confidently say that Air Mouse will almost always be up to the task whenever you may need it. Check out the Air Mouse website for more information (including a highly recommended video demo) or purchase directly from the App Store for $5.99. I installed it & got warnings about opening my firewall to use it. Is it safe ? Apart from Airmouse, one can use apps like R-HUB remote support servers for remotely controlling MAC or PC from iOS devices. It works well.